S.H.Figuarts Kuroto Dan First Look! 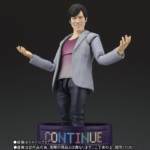 As you may recall, Bandai teased that the god of programming himself: Kuroto Dan would be getting an S.H.Figuarts release, and it seems that the time for his release is sooner than we might think. Photos of S.H.Figuarts Kuroto Dan are now online, thanks to some data mining from @_Erasu via Twitter and it looks like there’ll be two flavors of God to choose from; a black suit version and a post-Continue version. Both are looking to be November releases according to his Tweets each one will have their own assortment of heads but the Continue Pipe will be included in the grey-suited post-Continue version. 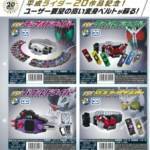 Dan Kuroto marks the first civilian form Heisei Era Kamen Rider character to be produced and we’ll be sure to update you on how much these bad boys will cost once the pre-orders go live. A must-have for any fans of Kamen Rider Gemm or Kuroto Dan! Pre-Order links for both figures have now gone live. Shin Dan Kuroto will retail for7344 while Dan Kuroto Shin retails for 6264.